After completing and successfully testing the portable board jack in the previous post, I decided to continue on with workbench workholding accessories. At this point, two clamping attachments came to mind. The first, an edge dog, alternatively known as a bench puppy, was modelled after a College Of The Redwoods derived design. This particular design was gained from a Timothy Coleman article on this type of workholding device, also derived from a College Of The Redwoods design. The premise of the edge dog is to use both the edge of a workbench top and one dog hole to hold a board on edge. This is performed through a unique design that hangs off the edge of the workbench top. When used in conjunction with a tail-vise, the edge dog excels at clamping the free end of a long or wide board along the edge of a workbench for jointing or other bench operations. The edge dogs are customized to the spacing of the dog holes on a workbench, this would be the distance from the edge of the workbench to the leading row of dog holes. The measurement I refer to can be seen in the following images. I applied a leather face to the edge dogs and also drove a reinforcing wedge into the 3/4 in. dowel. The edge dogs are a combination of beech and maple, essentially what I had lying around in these dimensions. A good example of how an edge dog can be used to hold a board on edge can be seen in the following image. One end is held by a edge dog whereas the other end is an add-on to a twin-screw vise which I discuss next. Instead of clamping a board to the surface of a workbench, the edge dog is used to clamp the board along the workbench edge and therefore at a more reasonable and lower height suitable for handplaning. Having a pair of these edge dogs allows either side of the workbench to be used. The edge dogs are created with opposing configurations as shown above. My current workbenches do not incorporate dedicated tail vises. 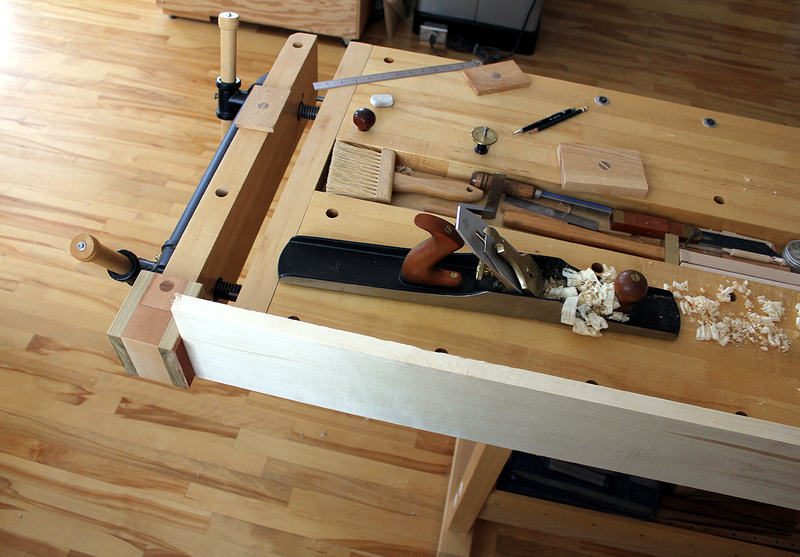 In place, I use a Veritas Twin-screw vise which performs as a tail vise when clamping boards on their face. When it comes to clamping boards on edge, the twin-screw vise can also be used along with bench dogs. The edge of the workpiece would be then sitting on the workbench top. However, this raises the height of the board considerably and is not very conducive to handplaning or jointing an edge of a board. Ideally, the edge of a board should be slightly higher than the workbench surface to effectively perform handplane operations. With this in mind, I created this outboard add-on to the twin-screw vise which extends the width of the vise movable jaw past the edge of the workbench. Shown above, this newly designed outboard add-on accessory is an addition to the twin-screw movable jaw. 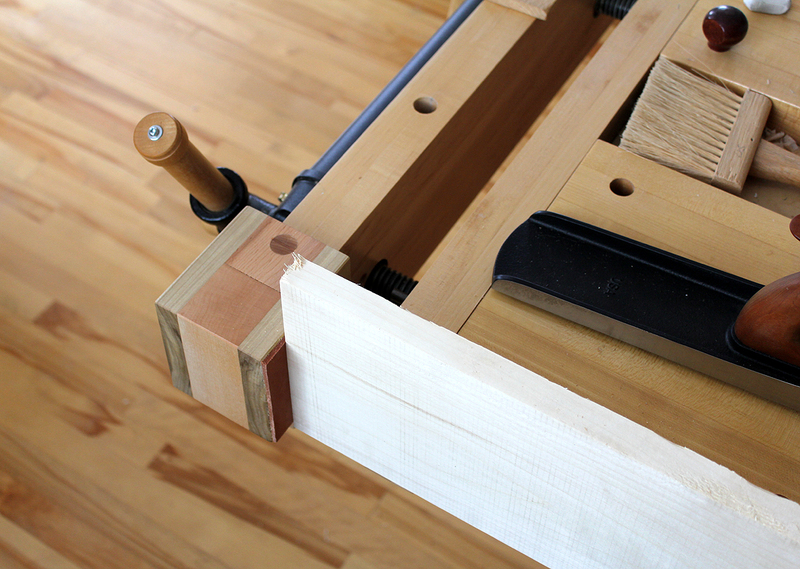 In effect, the vise now becomes an enhanced tail vise capable of clamping boards on edge along the side of a workbench. The clamping is done in conjunction with the previously mentioned edge dog. Images of a board being clamped between these two accessories are shown below. In these photos I am jointing the edge of a white ash board. 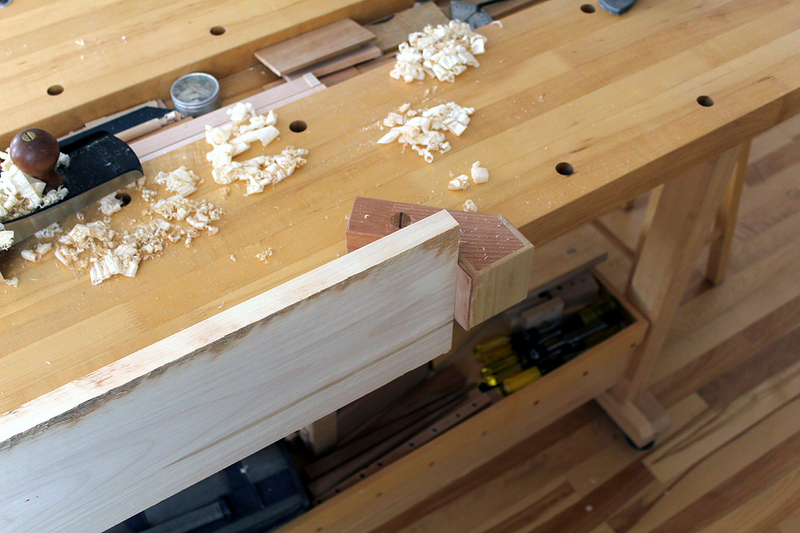 I was surprised at how tightly the board is clamped with minimal tension applied to the twin screw vise. The friction from the leather pads contribute to this as slightly more tension was necessary before applying the leather pads. The outboard extension to the twin-screw vise is removable and can be adapted to either side of the twin-screw vise. 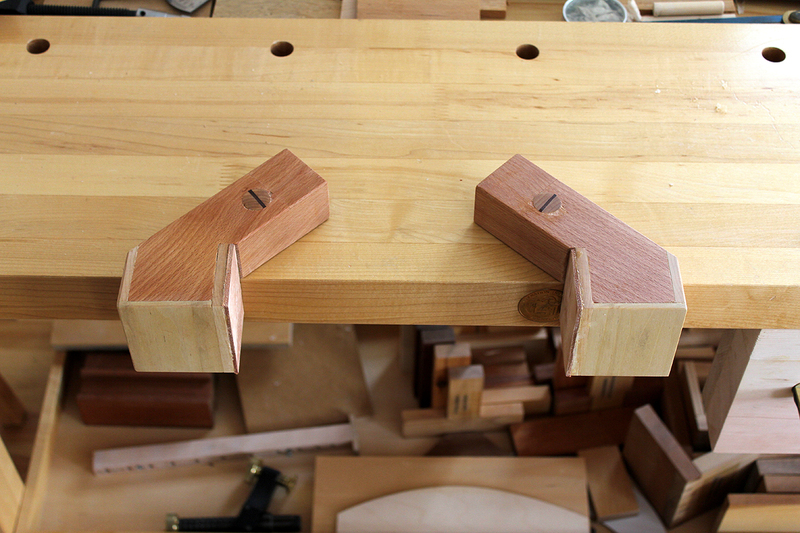 I am left-handed so having it located to the right of the vise as shown, is more practical. 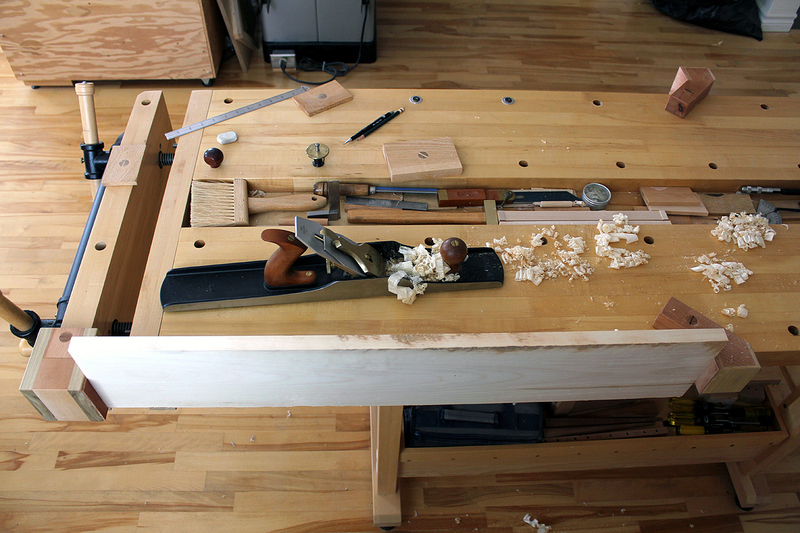 For right-handed use, the opposite edge of the workbench would be used for jointing. As an added bonus, there is no racking of the twin-screw vise regardless of the clamping pressure I apply to the outboard extension.